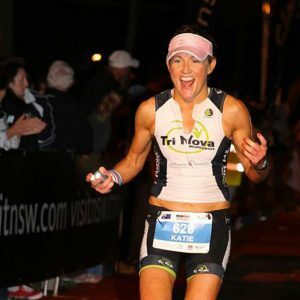 Paratriathlete Katie Kelly is an Australian Polar Ambassador who lives with the degenerative disease, Usher syndrome. The Paralympic gold medallist and World Champion has overcome many obstacles and is a true inspiration as she leads a life in which every challenge and opportunity is embraced. Katie often reflects back to that fine day in September 2016. Standing on the winner’s podium at the Rio Paralympics, with Copacabana Beach providing the most magnificent back drop. Gold medal around her neck. For Katie, many of her earliest memories are those central to the person she has become today, as she explains. Her early years were filled with speech therapy and additional tuition as she strived to catch-up to her peers. Progressing through her teens, the hearing loss she suffered was manageable. The significant technological advancements in hearing aid devices, meant that her hearing impairment was able to stay at the same level. She suffered a crushing blow, when at age 22, she was told that her eyesight would deteriorate and eventually lead to blindness. Katie Kelly had inherited a deaf blind condition called Usher Syndrome. Katie’s strong character and determination prevailed. As her sight deteriorated, it became obvious that her condition was going to be a persistent and increasing challenge to her every day. It was then, Katie made the conscious decision to embrace her situation. Her parents had a great influence on the mindset of Katie and her four siblings. It has always been instilled in me that my circumstances are nothing other than that. They are simply what I make it. She no longer questioned her capability against her peers or the value she could add in her day to day life. Exercise and competition became central to her wellbeing. A self-confessed weekend warrior, Katie concentrated her efforts on competing in marathons around the World, including Alice Springs, New York and Norway. During this period, she embarked on a high intensity endurance training regime, which would ultimately lead her to the opportunity to challenge for the Paralympics. In many of these events, Katie has recorded her efforts with her various Polar devices, including her first Polar, the original Polar F4, and later the Polar V800 and Polar M400. Katie has fond memories of those preparation years and enjoys pulling up an old personal best (PB) on her Polar watch. 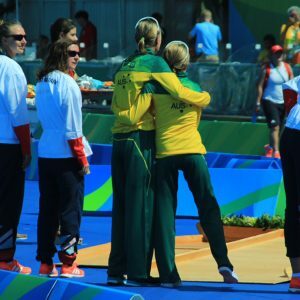 To her, all those moments lead to her special day, standing on Copacabana Beach, gold medal in hand. In life, we are shaped by all sorts of obstacles; personal or otherwise. Some of us may have had learning difficulties, others have life changing circumstances that lead to loss of mobility or mental capacity. Some of us lose our parents at a young age, or have parents who are simply not present in our lives as loved ones. Others of us are struck by serious illness. Whatever it is, we all have an opportunity to make the most of who we are and on any given day. Katie Kelly lists the establishment of her own Foundation, Sport Access Foundation which provides grants for children with a disability to play sport, as one of her proudest achievements. Information in this article is not intended as medical advice and is the opinion of the featured athlete. Before pursuing any physical activity or program, you should consult with a medical professional. Camille Herron’s scientific approach to endurance running has helped her succeed on road and trial. Read how she uses effort level instead of pace to guide her training. Will Davison is one of Australia’s premier professional racing drivers and a keen triathlete. Read how he prepares for his first Ironman 70.3. Here’s everything pro triathlete Angela Naeth has learned (and wants you to know) about triathlon training for the final (and her favorite) leg: the run.